Our perception of the world, likely now more than ever, is a result of a media induced society that aims at unleashing our empathy on those who have undergone some experience. It sounds vague, but let us not kid ourselves, anything can be news. This is the first lesson in understanding bias. Perhaps you’re tired of reading, watching, or hearing about Iraq, but I have to admit that my own ambivalence towards what was happening over there was lifted after watching several documentaries. More than changing my views on Iraq, which wasn’t really my intent, they helped me to refine my views on the media. The first documentary I watched was Control Room (2004), which provides insight into the infamous Al Jazeera network, and the perception of the war created by both Middle Eastern and American coverage. After about a half an hour of watching I started to realize that I really had no idea what was going on in Iraq, or the middle east for that matter. I became conscious to the fact that my entire view of the war had been shaped by heated debates and broadcasts that often played the Americans as struggling heroes and the Iraqis as victims or lunatics. Even worse, I realized that most Westerners who are not directly linked to the conflict are probably having their minds made up in much the same way. Directed by Jehane Noujaim, Control Room is filmed in Iraq and focuses on many of the media correspondents and military spokespeople located there. It’s a real eye opener that delves into the problems of open and honest media when anyone can access it. However, the films real strong point is it’s realistic, no nonsense Iraqi perspective that allows you to come to your own conclusion about what you may be watching on the nightly news. 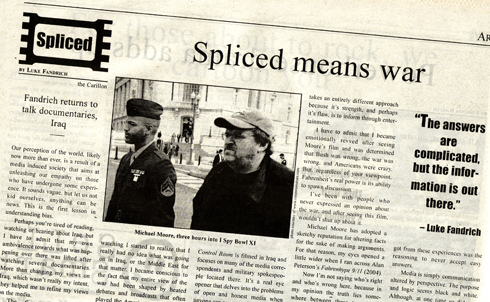 Of course, Michael Moore has to come up when talking about Iraq because of his latest release Fahrenheit 9/11 (2004). This film takes an entirely different approach, because it’s strength and perhaps it’s flaw, is to inform through entertainment. I have to admit that I became emotionally revved after seeing Moore’s film and was determined that Bush was wrong, the war was wrong, and Americans were crazy. But, regardless of your viewpoint, Fahrenheit’s real power is it’s ability to spawn discussion. I’ve been with people who never expressed an opinion about the war, and after seeing this film, wouldn’t shut up about it. Michael Moore has adopted a sketchy reputation for altering facts for the sake of making arguments. For that reason my eyes opened a little wider when I ran across Alan Peterson’s Fahrenhype 9/11 (2004). Now I’m not saying who’s right and who’s wrong here, because in my opinion the truth lies somewhere between these two films. Moore is clearly a democrat and Peterson a republican, but from Peterson’s lesser known film I was amazed at hearing how some of the people who were in Moore’s film actually felt. Ultimately these three films share very different opinions that are expressed in equally different ways. Although each of these films make great arguments, what I really got from these experiences was the reasoning to never accept easy answers. Media is simply communication altered by perspective. The purpose and logic seems black and white. Although, at one time so did war, and yet here we are living in a world where buses, hotels and skyscrapers are targets and still most people don‘t understand why. The answers are complicated, but the information is out there. The good news is that if you’ve reached this point in my article you’ve at least attempted to understand another viewpoint. And for the sake of what I’m trying to say, that’s a good start. I think people are getting sick of 2 things. 1. thinking forthemselves and 2. having diferent point of view for them to think presented. I remember Farenhiet 911 and I was pissed off that it was a huge thing. All it stated was that Gearge Bush is a big fat idiot. Although his styling and ways do bring some good points, for example when he tries to get state heads to enlist their children. Unfortunately his point gets lost in the quest against bush. Now I can't stand to watch the docs on the war. I have wanted to see them for a long time and don't bother b/c I fear they will be one sided and eventually piss me off. There is so much we won't understand but the first trick is not beleiving what you are told and not getting worked up in one way. If you are interested research and make up your own mind. Lastly, why do people love sunsets so much? ?